What is it about Sundays that are so different to any other day of the week? The energy is completely different; there’s a stillness to it. This morning we awoke to grey skies and a light drizzle that gently misted my face as I walked to the corner coffee shop for breakfast cappuccinos . The tree lined streets of my neighbourhood sprinkled with orange leaves, a picture perfect October morning. I was raised with a lot of structure and it’s something I appreciate because there’s less stress or rushing when things are planned ahead of time. So by the time I finished flipping the last breakfast pancake, I already knew I’d be making my favourite Autumn Squash Soup for dinner. You can keep it vegetarian by leaving the Pancetta out. This is actually 2 recipes in one as the garbanzos need to be roasted and seasoned separately. 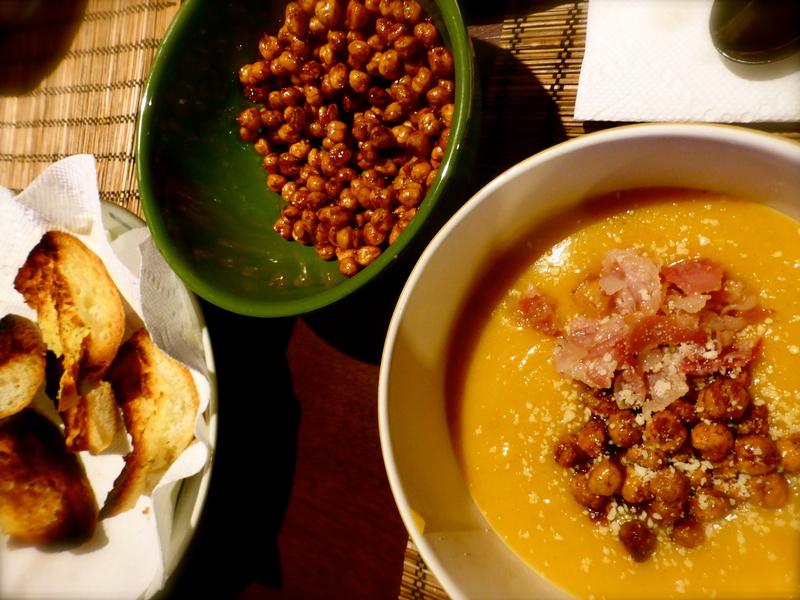 Start with roasting the garbanzos as it takes a good 40 minutes and they’ll be ready just in time with the soup. 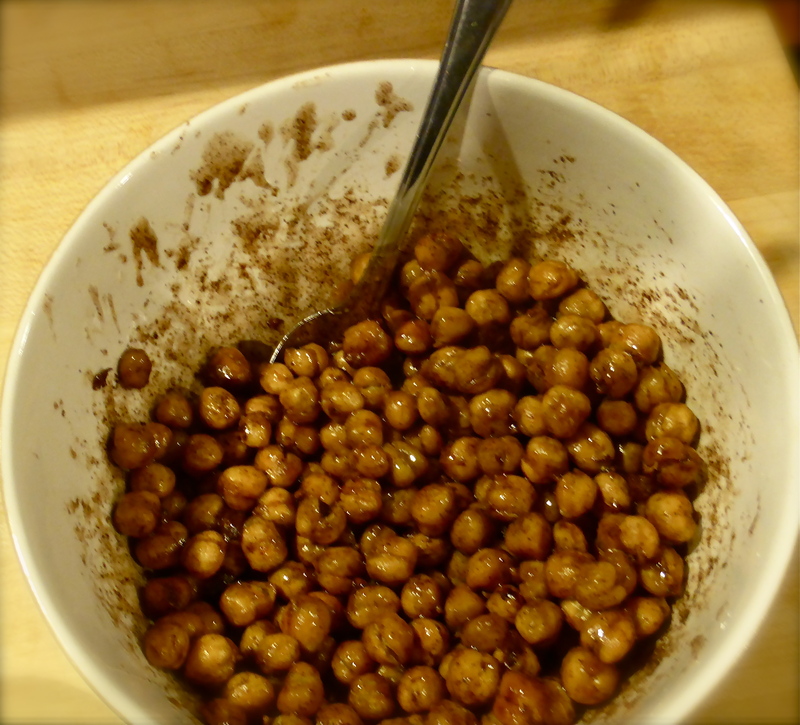 Drain the can of garbanzos of all the liquid and pour them over a thick layer of paper towel. Cover with another layer of paper towel and pat dry. Now transfer the garbanzos to a cookie sheet, drizzle with olive oil and mix to coat. Place in the oven and bake at 400F for 30 – 40 minutes mixing every 10 minutes so they roast evenly. Once the garbanzo feels toasted (crunchy like a nut) transfer them to a bowl and mix in 2 tsps honey, 1 tsp cinnamon, salt to taste, a drizzle of olive oil and a pinch of nutmeg. If you’d like (I did) place them back in the oven to roast for an extra 10 minutes. While I roasted the garbanzos one last time, I added the garlic bread to the oven to broil. 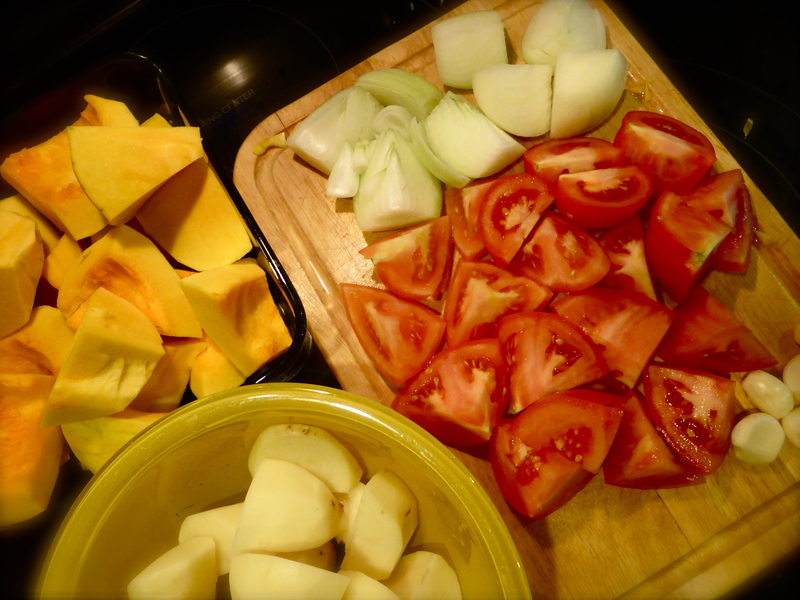 Start with my least favourite part – peeling and chopping the squash. 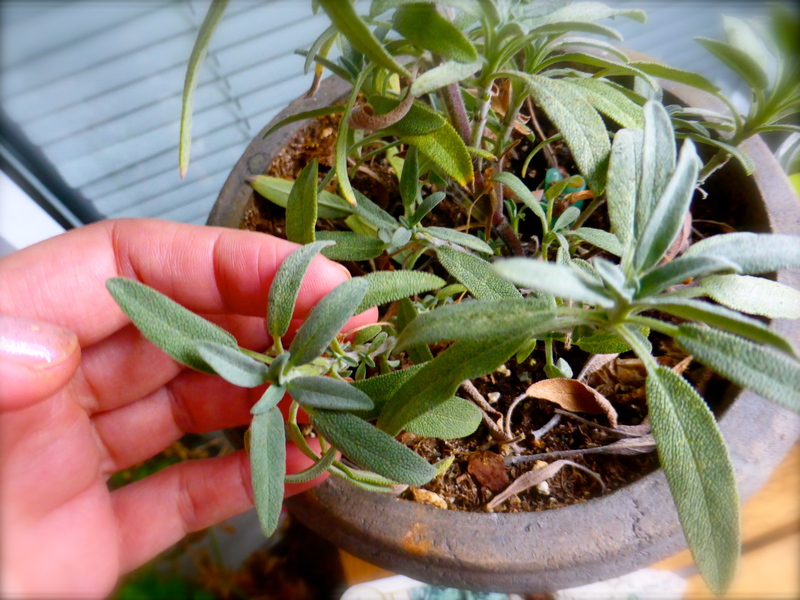 Scoop out the seeds and pulp with a spoon. Chop all your veggies in big chunks as they will later be going in a blender anyway so no need for fancy chopping. 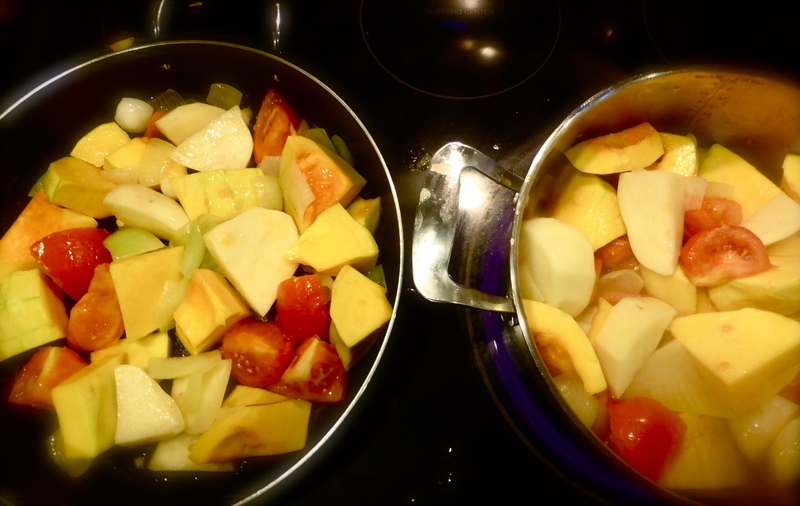 Squash, Onions, Garlic, Potatoes, Tomatoes. In a large pot, add Olive oil and sautee onions and garlic until fragrant. Add the tomatoes and stir until both onions and tomatoes begin to soften and release juices. Add Potatoes and stir for a few minutes, then add Squash. Cover and let cook for about 10 minutes. 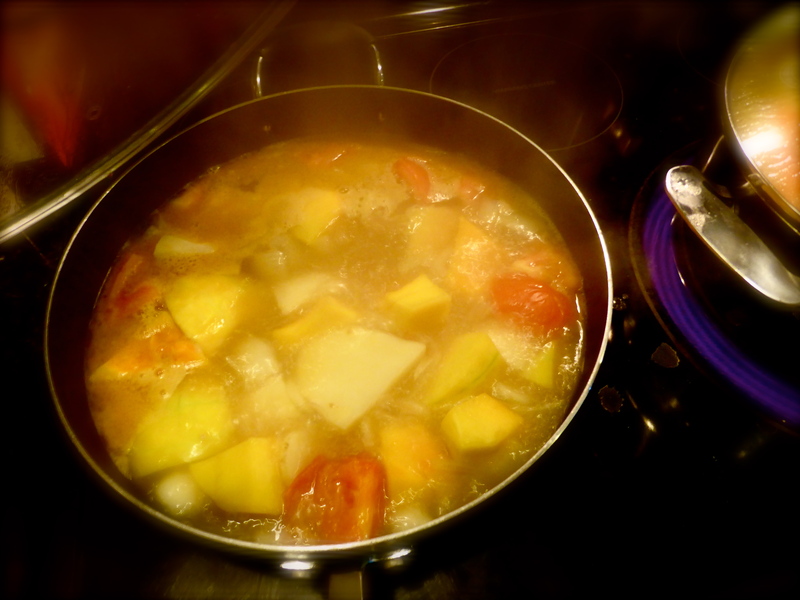 Add the broth, cover again and at high heat, let soup cook until squash and potatoes are soft. With a soup ladle, add soup to blender. You will have to do this in batches. Never fill the blender to the top. It could blow the lid off and burn you. Keep another pot handy to transfer the blended soup. 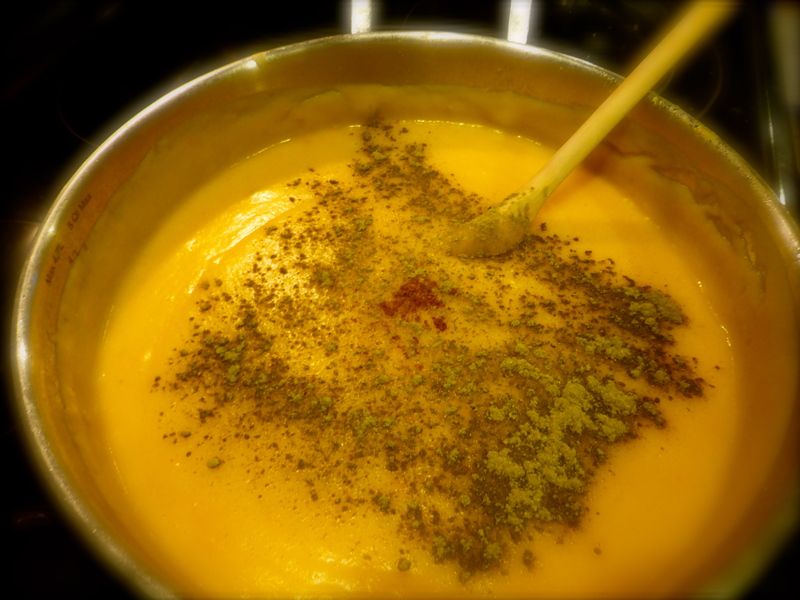 Keep the newly blended soup on low heat and taste, then add salt and pepper as needed. Just before serving, add sliced Pancetta to a pan and stir until crispy. 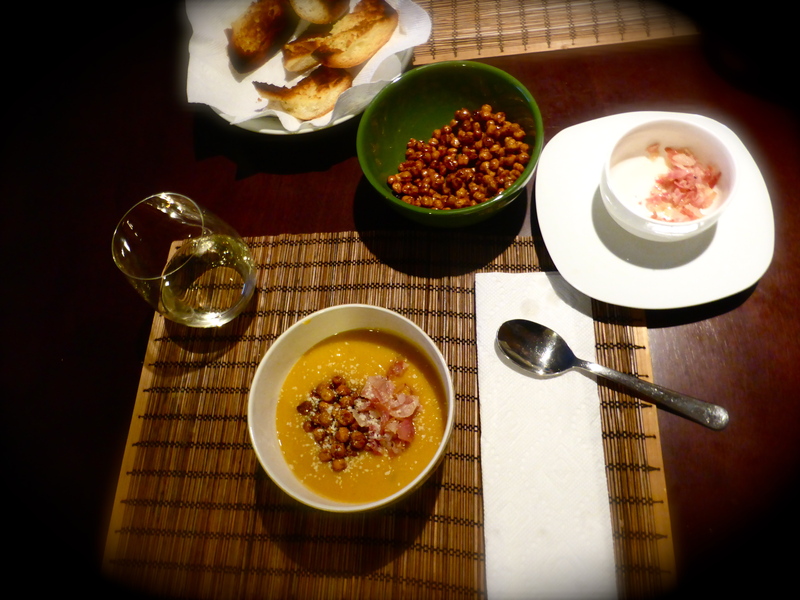 Serve soup topped with pancetta and garbanzos. I added a dash of parmesan cheese too.